Miss Anna is back with 28 more songs! Volume II is, as one admirer said, “A gold mine of kid biz ditties!”. Wow!! Anna has updated several old time favorites such as When the Kids Go Marching In, Here Sits a Monkey, Hey Lolly Lolly, The Raspberry Patch and Aikendrum. Played on the guitar, banjo or mountain dulcimer, these songs keep children entertained, whether they’re listening, singing along, or making up their own new, wacky, fun verses. Anna’s singing style is clear and melodious. The words are easy to understand, even when she’s singing in Kiswahili and Spanish; in any case, all the lyrics are printed inside the four inside panels of the eco-friendly cardboard case. Siempre Abuelita, by Tish Hinojosa, is a love song for all the Grandmas, Nanas & Abuelas who create wonderful memories for all their ninas & ninos. Malaika, by William Fadhili, is a popular East African lullaby. Armed with a notebook, mini-tape recorder, and an open mind and heart, Anna learned this song during a trip to Kenya. Anna spends more time researching song origins and histories than she spends in the studio recording the songs! Did you know, for example, that London Bridge has six verses, and you can see the actual bridge in Lake Havasu City, AZ?! Buffalo Gals, was written in 1844, and was also known as Dance With Dolly. Song information is included inside the CD cover. Finally, a word about the graphics. The CD, cover and inside photographs feature a happy group of 6-month to 4 ½ year old children playing instruments, drumming, and dancing with Miss Anna. The colorful cast of characters include Anna’s five young nieces, nephews & one great-nephew who all happen to have been in Miss Anna’s classes at one time or another! Big news, two more nephews are on the way, so keep on the lookout for another new Miss Anna CD in the works! 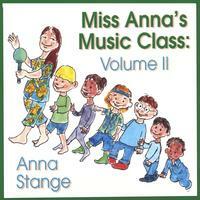 You will fall in love with Miss Anna’s Music Class when you hear this CD. Send her an email, and she’ll keep you posted when she visits in your area. Yes, it could happen; Anna spends several weeks a year traveling around the country singing and performing for audiences of all ages. Buy this CD! You'll love it!!! The CD is just terrific! A gold mine of kid biz ditties. Thank you so much for Volume two! A gold mine of kid biz ditties. Sounds like you personalized this one for the kids in one of your special classes...which is a nice touch to match the great graphics. The new CD is really good. Anna, the new CD is really good. I think the sound os one of the best. My two children ages 6 and 4 love this cd. My class requested your CD- I had you on repeat!